How Diabetes and Gum Disease Can Make Each Other Worse! Can Make Each Other Worse! There is a STRONG link between diabetes and gum disease, and it goes both ways. That is to say, your diabetes will make you more prone to getting gum disease, AND on the other hand, if you already have some gum disease, this makes your diabetes more difficult to control. Why does diabetes tend to make you more prone to gum disease? When you have diabetes, there are 2 effects generally on your body. First, the structure of your blood vessels becomes altered - they become narrower. In turn, these narrower blood vessels affect how blood can flow through the vessels, (more slowly) which then results in a less effective immune system and so more chance of infection. Try thinking of it this way. Imagine your blood vessels as a pipe carrying water to a swimming pool. That water contains dilute chlorine to prevent bacteria building up in the pool. If the inside of the pipe gets narrower for some reason, then less water can flow through it. Less water means less chlorine, and so more bacteria in the swimming pool. Your blood circulation carries your immune system around your body. If the blood flow is restricted, your immune system doesn't work as well. You are more prone to getting infections, including gum disease. The second effect is that when you have diabetes, you may have higher levels of glucose in your mouth than normal. This can "feed" any bacteria that are getting a foothold, for example the bacteria under your gums responsible for gum disease. So much for diabetes making you more likely to get gum disease. But what about the flip side? How can gum disease affect diabetes? Any infection in the body tends to alter your metabolism. Your immune system senses that there is an infection, and gets the white blood cells into action. The whole process of defending itself against infection puts a strain on your body, and your whole metabolism changes. In a person with diabetes, this makes it harder to control the blood sugar levels. Whether you are having insulin injections, tablets or controlling your diabetes by diet, any infection will throw out your calculations. Infections that can do this include severe gum disease. It has been shown that reducing or getting rid of gum disease helps to stabilize blood sugar levels in people with diabetes, making it easier to control. If you think you might have diabetes, here is a great page about the symptoms to look for: Diabetes Symptoms. There's LOTS of information there describing what to look for. you may be more likely to get gum disease. You need to see a dental hygienist or a dentist regularly. IF you control your diabetes really well, you can reduce your chances of getting gum disease. 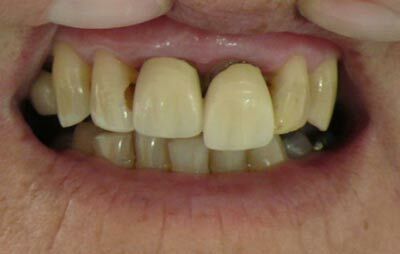 Read How to cure gum disease for instructions on the most effective ways of dealing with gum disease. If you have had periodontal disease in the past, it is still important to see a dentist at least every six months to monitor your gum condition. Do NOT smoke. Smoking really makes gum disease worse! 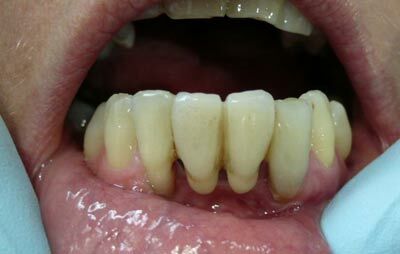 Again, the long-term effect of smoking is to reduce the bloodflow through the fine capillaries in your gums. REMEMBER, smaller blood vessels means less blood flow and higher chance of infections! To help control gum infections, I recommend Therabreath mouthwash. Click on the image below to get a great deal at Amazon! Diabetes and gum disease do NOT necessarily affect each other, if you can control both of them. That means being extremely careful with the diabetes treatment prescribed by your doctor, AND taking a bit of time and care in looking after your teeth and gums. I recommend sticking to the procedures listed in How to cure gum disease for everybody, ALL of the time. After all, prevention IS better than cure!